If you’re running a sales or marketing using Drift, having the tools to ensure that your team is communicating with the right people is important. We want you to be able to sleep at night knowing that your sales reps are focused on their leads only so you do not have to deal with confusion and overlap, and so you can control the settings around campaigns they don’t get to touch. You can also think about it like this...a BDR or SDR team might talk to all leads and then pass them off to reps - those reps should login and only see their leads...not all the others. They need to stay focused and ownership needs to be clear. These are people who jump on a conversation as soon as they get a notification for their specific leads and conversations. The Drift Morning Report may not be enough to know if your team is acting efficiently and collectively, which is why we released the Team Access view. Now when you are inviting your team members to join you on Drift you can choose which conversations they can be a part of and which conversations they will not have access to. You can do this through the invitation process of adding members to your team. This will allow team managers to feel like they know that their sales team is talking to the right people and so that team members will not be jumping into conversations who already have a salesperson trying to close a lead. You can ensure that your team is talking to the right people by marking them a participant in conversations, or you can monitor who should not be in specific conversations and remove them as participants. Conversations can have multiple participants, so that everyone who is assigned to a conversation can ensure that your leads are being taken care of. From your customer success managers to your salespeople, those who are participating in a conversation will get notifications when someone responds in your chat so that they can stay up-to-date on a specific customer. 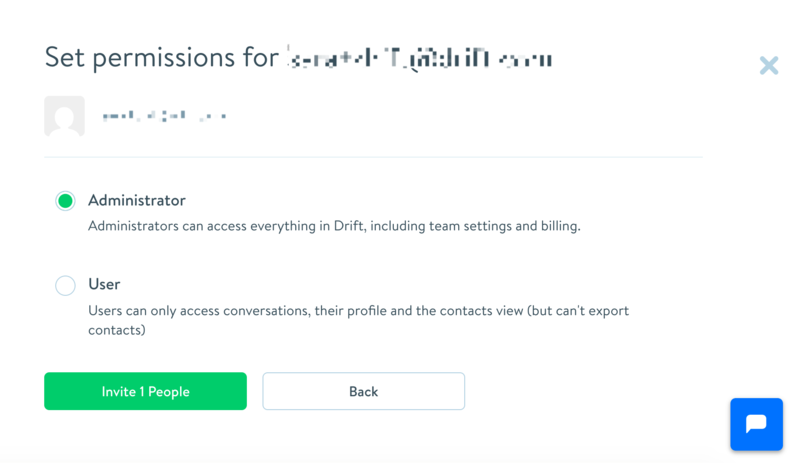 Here’s how to setup your Team Access feature in Drift. If you want more information on how to setup this feature, click here.